Barbara Watson's passion for healthy cooking led her to develop skill in the preparation of natural foods, and she now dedicates her energies to sharing natural health information and total vegetarian recipes that are simple, but delicious! She is the director of StepFast Lifestyle Design, where she collaborates with leading experts in preventive medicine in a lifestyle education video series which gives step-by-step instructions on how to engage in a simple lifestyle designed to help prevent disease. I want you to feel right at home as I endeavor to help you to prepare the best quality, most delicious total vegetarian (vegan) foods for you and your family. Healthy eating never tasted so good! Whether you're a veteran vegan cook or a hopeful greenhorn when it comes to vegetarian cuisine, the recipes and resources offered here will be of amazing benefit to you. From Veggie Patch Flatbread to Vanilla Ice Cream, from Roasted Root Vegetables to Carob Mocha Mousse, you'll find a recipe to answer every vegan culinary challenge. In addition to "Compliments to the chef!" you'll begin to hear comments like, "I feel better!" It really is possible to dine your way to better health! The mission of Total Vegetarian is to make you aware of the incredible health benefits of the total vegetarian or vegan lifestyle, and provide fabulous recipes to help you make it a reality. Medical studies now give us proof positive that a plant-based diet can help prevent and even treat heart disease, cancer, diabetes, obesity, as well as depression. Total Vegetarian is committed to keeping you informed and equipped so that you can provide the healthiest foods for yourself and your family. The best in simple but delicious recipes, informative books and videos, my favorite kitchen appliances and resources for natural foods make up TotalVegetarian.com. 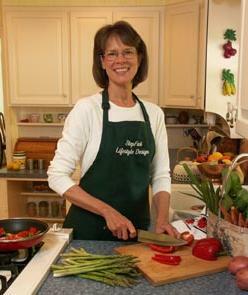 Explore recipes from The Total Vegetarian Cookbook by Barbara Watson. Why Total Vegetarian? Visit Barbara's Blog!! !